A beautiful Slava morning at St. Sava Cathedral in Parma was enhanced by the many children dressed in folk costumes who attended the liturgy with their parents and grandparents. The Holy Hierarchical Divine Liturgy was officiated by His Grace Bishop Irinej of Eastern America with the concelebration of the host priest V. Rev. Dragoslav Kosic and Protodeacon Milos Zdralic. This divine service was made all the more beautiful by the voices of the Serbian Singing Society „Njegos“ while the children' choir added an angelic presence. In his homily His Grace, our Bishop Irinej, spoke of the gospel of repentance read at the liturgy, the pride of the Pharisee and the humility and fear of God of the Publican teaching us and showing us that repentance is the key to those true doors that lead us to the heavenly kingdom. 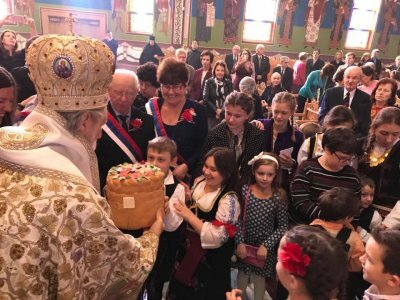 With sincerity Bishop Irienej congratulated the parishioners on the occasion of their Church Slava, the first archbishop of Serbia, Saint Sava the Englightener wishing them all the best, saying, „The Lord has given to our people a beautiful angel, Saint Sava, who bleeds every time whenever we sin“. He mentioned the words of Bishop Nikolai who said that Saint Sava prays for the Serbian people. He also spoke of Rastko's flight to the Holy Mountain, the burning of his relics on Vracar and the unshakable and indestructible spirit of Saint Sava among our people. He concluded his homily saying that Saint Sava is the all-Serbian Slava, he is the protector, helper, hope and gate to the Heavenly Kingdom. The children, with the kumovi, Renetta, Jake, Biserka and Renetta Jr. Mikleus, hurried to attend and partake in the cutting and turning of the Slava Kolach. They were delighted when the bishop gave each of them parts of the kolach which has decorated it. According to the old Serbian tradition, the kumstvo for the following year was accepted by Dragana Majstorovic with her daughters Vasilija and Jelena. Following the liturgy the St. Sava celebration continued with a luncheon in the beautifully decorated church hall. Attending the celebration were Protonamesnik Dragan Goronjic, Dean of the Cleveland Deanery from the St. Demetrius Church in Akron, Fr. Sinisa Hrvacevic from the St. George Church in Lorain and Sister Anastasija from Monastery Marcha. Following the lunch the program in honor of St. Sava began, consisting of selections by the choir, solo and group singing, recitals and folklore dancing. The children once more showcased the effort they put in the program which was followed by applause and praise from all in attendance including His Grace Bishop Irinej of Eastern America. A heartfelt thank you to our children, teachers, parents, leaders, sisters in the kitchen, the service, our dear guests and to all that made this day all the more beautiful and contibuted to us celebrating our church slava in such a beautiful manner.